Harry Potter Sweater Vest – just one of our free knitting patterns! 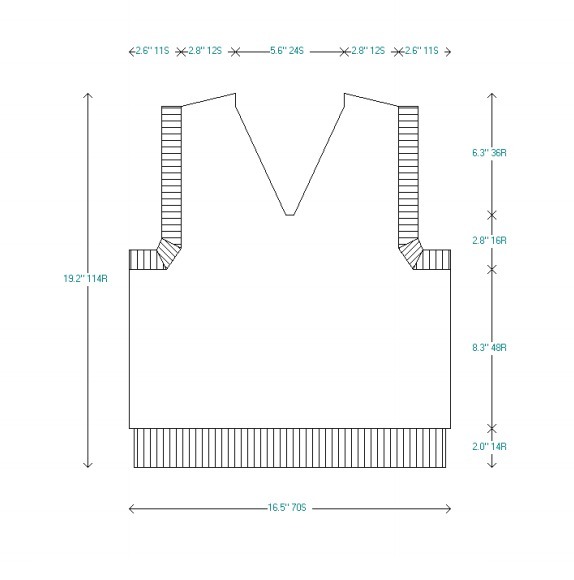 This pattern is for a Child’s Size 10 sleeveless V-neck vest with ribbed armbands and neckband. The shallow back neckline is designed so that the back neckline sits smoothly across the back and for a more shaped fit around the neckline. If you prefer, you can eliminate the neckline scoop decrease step for a straight back neckline. Transform it into a cardigan vest by knitting the front in two pieces. Instead of a button band, sew in a seperating zipper and add a touch of whimsy with these super cute, interchangeable (and collectible) zipper pulls. 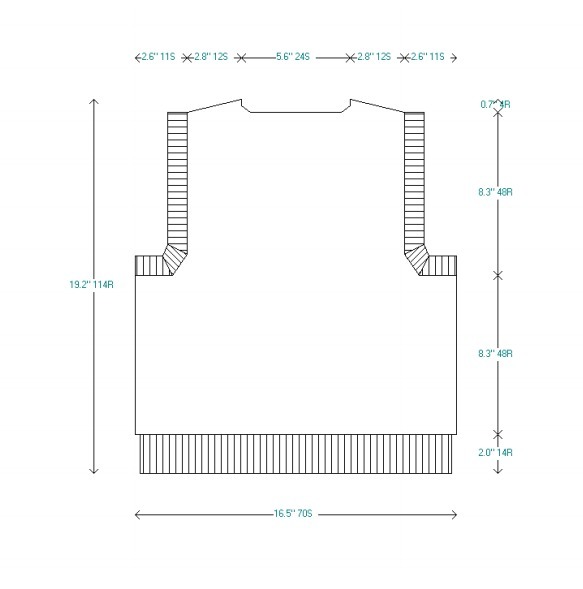 This pattern is for a sleeveless Hogwarts® styled Hogwarts© styled uniform vest. Stitch & Row Gauge: Gauge (Stocking Stitch over 4 in = 10 cm): 17.0 stitches by 23.0 rows. Finished measurements are given in inches with average wearing ease already added to the drafted pattern. Note: Read ALL these instructions thoroughly BEFORE starting to knit the Wizard School uniform vest . Necklines and shoulders are worked at the same time. We like to make our decreases 1 stitch in from the edge to allow for a neat pick-up for neckband and armbands. 1. Cast on 68 stitches on size 6 needles. Work in Knit 1 Purl 1 ribbing for 2 inches (5 centimeters). 2. Change to size 8 needles and begin stocking stitch. On Row 1 (right side), increase 2 stitches evenly across the row for a total of 70 stitches . Knit 1 wrong side row. Change yarn to selected House colors and knit a 2 color stripe (according to desired style). Chamber of Secrets® stripe is 3 rows wide – 1 row in dark color/1 row in light color/ 1 row in dark color. Continue in stocking stitch and main color. Work even until piece measures 8.3 inches (48 rows), excluding ribbed hem. 3. Begin armhole shaping. Cast off 8 stitches at beginning of next 2 rows. Decrease 1 st at each end of every alternate row for 6 rows until 48 stitches remain. 4. Begin neck shaping. Work both sides at the same time. Work 14 stitches. Slip the next 20 stitches to a holder. With a second ball of yarn, work the remaining 14 stitches. Decrease 1 stitch at neck edge every row twice, until 12 stitches remain. 5. At the same time, when armhole measures 8.3 inches (row 48), start shoulder shaping. 6. Begin shoulder shaping. Cast off 6 stitches at armhole edge twice. 1-2 Follow steps 1 and 2 as for back when knitting the Wizard School uniform vest front piece. 3. Armhole. Decrease the stitches for armhole at both ends, as for back. Continue until armhole measures 2.8 inches (16 rows), with 48 stitches remaining. 4. Divide for the neck. Work both sides at the same time. Work 23 stitches. With a second ball of yarn, cast off next 2 stitches and work remaining 23 stitches. 5. Shape neck. Decrease 1 stitch at neck edge of next row, then every 2nd row once, then every 3rd row 10 times, until 12 stitches remain. 6. Work even until armhole measures 8.3 inches (48 rows). 7. Shoulder shaping. Cast off as for back. 1. Sew fronts to back along shoulder seams. The neck band is knit on size 6 needles and worked in 2 pieces. Beginning knitters can overlap the band while more experienced knitters can pick the band and work a mitered V- neckband. Work the House stripe as directed in Step 2. 1. With right side of work facing, pick up and work (starting at bottom of front neck) 27 stitches from right front neck edge, 2 stitches from right back neck edge and 10 stitches from back neck holder to center. You have a total of 39 stitches. 2. Work 1 inch (8 rows) in Knit 1 Purl 1 ribbing. Knit 3 rows in main color, a total of 3 rows in the contrast House trim and and another 2 rows in main color. 3. Cast off loosely, using the method described in the video below. It is, by far, the most elastic bind off for everything from sock tops to ribbed single neck bands. 4. Work the left side the same way as the right, picking up the back neck stitches first. The vest armhole ribbing is knit on size 6 needles. 1. With right side of work facing, pick up and work 106 stitches along armhole edge between side seams by picking up one st for every armhole cast-off st and one for every row. 2. Decrease from 106 stitches to 74 stitches in this way: Purl 6, Purl 2 together, *(Purl 1, Purl 2 together)* 31 times , Purl 5 stitches. 3. Work in Knit 1, Purl 1 ribbing for 6 rows. Cast off loosely. 1. Sew side seams. Sew any remaining seams. Overlap the neckband at center front. 2. Darn, weave and sew in all loose ends. This is only an estimate. Measure a sample piece for a more accurate calculation. Buy an extra skein of the main color to be on the safe side. Red Heart® by Coats & Clark is an inexpensive, worsted weight yarn which will knit up into an low-cost costume prop. Coats & Clark yarns are 100% acrylic, machine wash and dry, and only $2.19 (when on sale) per 6 ounce skein at Joann Fabrics! 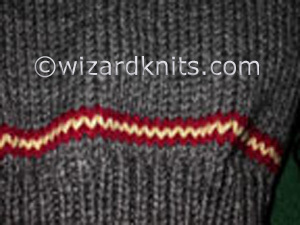 The Grey Heather [color 0400] is perfect for the original wizard school uniform sweater. You only need 2 skeins [348 yards, 6 ounces] to knit the vest – and knitting needles of your choice in sizes US #6 and #8. As noted above, we make a habit of buying an extra skein just in case we need it. Although many crafting yarns do not have dye lots, some still have color differences from batch to batch. Solid colors come in 482 yards, 8-ounce skeins. Knitters can certainly select their color preferences from other yarns as long as the stitch and row gauge is the same as the main yarn – in this case, Red Heart® by Coats & Clarks. Don’t know about you but I love square wooden knitting needles . They work wonders for my hands and wrists. Get out your favorite knitting needles. This is a quick knit project thanks to worsted weight yarn. Remember, it’s never too early to begin knitting a Wizard School uniform vest for Halloween!